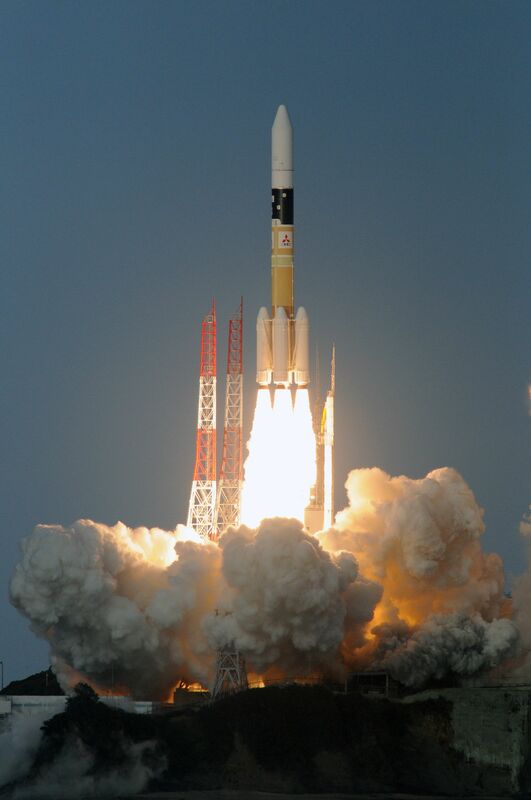 Japan’s H-IIA rocket has returned to its sea-side launch pad at the Tanegashima Space Center for the second launch attempt with Quasi Zenith Satellite 3, following a scrub last week and repairs completed inside the rocket’s assembly facility. Saturday’s multi-hour launch window opens at 5:29 UTC and stretches until 13:16, providing plenty of time to get the 53-meter tall vehicle off the ground. To lift the 4.7-metric ton QZS-3 satellite to Geostationary Transfer Orbit, H-IIA is pulling out all the stops – flying in its heavy-duty 204 configuration with four Solid Rocket Boosters to deliver the additional kick needed to send the craft on its way via a 29-minute ascent mission by the two-stage launcher. Also called Michibiki-3, the satellite takes a special role within the QZSS navigation augmentation system as the sole geostationary member of the planned four-satellite constellation, beaming down correction messages across the Asia-Pacific Region to enhance GPS and Galileo navigation. The H-IIA F35 rocket stood fully fueled atop Launch Pad 1 last Saturday when the day’s launch attempt had to be called off over two hours into the launch window due a leak on the first stage’s Helium system that could not be solved through troubleshooting steps with the rocket fueled on the pad. Consequently, H-IIA was de-tanked and returned to the Vehicle Assembly Building for inspections on the system in question that holds high-pressure Helium in a central tank and delivers pressurized gas to the fuel and oxidizer tanks during flight to keep them at the proper pressurization levels. 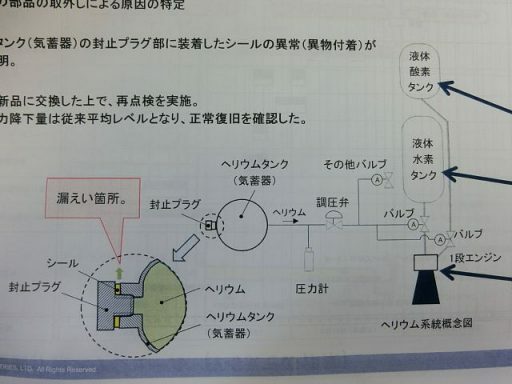 In a press conference, launch vehicle operator Mitsubishi Heavy detailed that a foreign object within the seal of the fill & drain plug on the high-pressure Helium tank caused that seal to leak which was picked up on sensors as a loss of pressure from the system. Replacement components were put in place and pressure integrity checks confirmed that the Helium system of the 37-meter long first stage was holding pressure. The foreign object, characterized as non-metallic and 0.5mm in size, was introduced during processing when the fill/drain port on the tank was sealed up since only one of two such ports on the tank is in active use. 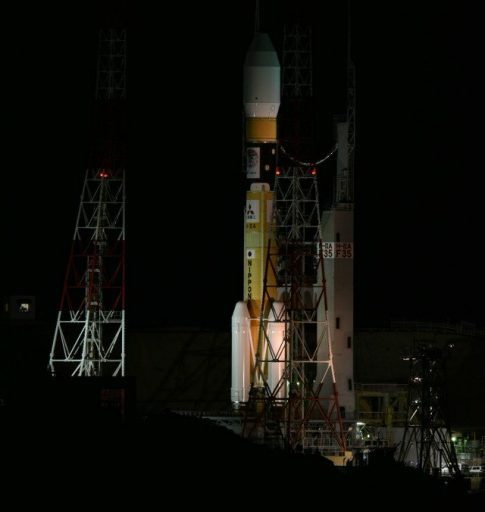 After repairs and re-testing, H-IIA was ready to return to its launch pad for liftoff on Saturday before weather conditions slightly worsen over Tanegashima at the start of the week. 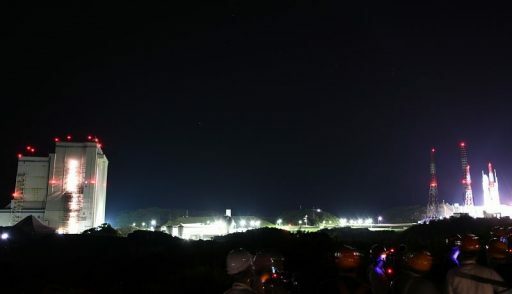 Launch services provider MHI confirmed at 12:08 UTC on Friday that launch managers had given the GO for the planned midnight-hour rollout of the H-IIA rocket to set up for the second launch attempt. 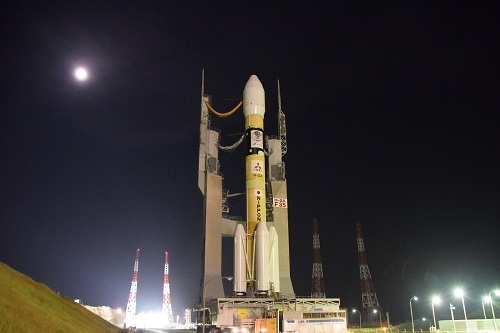 H-IIA started its rollout at around 12:30 a.m. local time, completing the 500-meter trip to Launch Pad 1 without issue to set the stage for a lengthy countdown operation. The launch of the QZS-3 satellite will be the fourth flight of the H-II rocket family in 2017, having already lifted the DSN-2 defence communications satellite, the IGS Radar 5 reconnaissance satellite and the QZS-2 craft. It will be the second flight of the more-powerful 204 variant in 2017 and the 35th launch of the H-IIA since its introduction in 2001. H-IIA 204 consists of a two-stage stack measuring four meters in diameter plus four SRB-A boosters clustered around the first stage. The vehicle stands 53 meters tall, weighs 443 metric tons at liftoff and lifts up to 15 metric tons into Low Earth Orbit and six tons into Geostationary Transfer Orbit. Arriving at the launch pad, the rocket’s Mobile Launch Platform will be hooked up to propellant, power and data interfaces and undergo power-up operations for an initial series of checkouts. 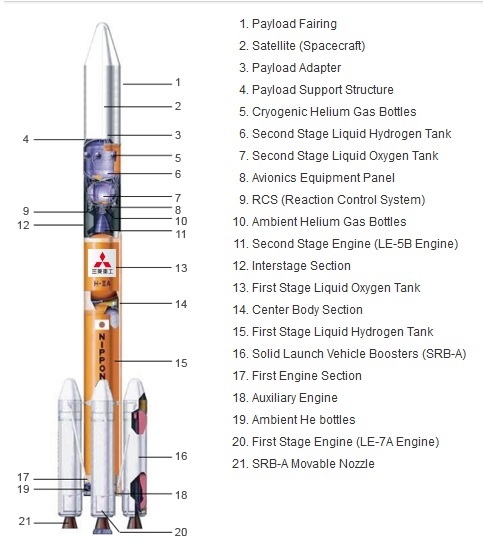 H-IIA will press into propellant loading around seven hours and 45 minutes before the opening of the day’s launch window, pumping 120 metric tons of -183°C Liquid Oxygen and -253°C Liquid Hydrogen into the two cryogenic rocket stages. After the three-hour fueling sequence, H-IIA will be kept topped up at flight level while engineering teams work through a comprehensive list of checkouts to clear the vehicle for a 60-minute terminal countdown operation that will transition to a fully computer-controlled mode at X-4.5 minutes to put the vehicle through tank pressurization, transfer to internal power and the control handoff from the ground to the rocket’s computers. H-IIA will start breathing fire at X-5.2 seconds when the LE-7A main engine will soar to life, spinning up its turbopumps and building up thrust under close supervision of flight computers to ensure the engine reaches operational conditions before the boosters are ignited – committing the vehicle to flight. At the moment of booster ignition, H-IIA will shoot off the ground with a total thrust of over 1,030 metric ton force – the boosters delivering almost 90% of the rocket’s thrust at blastoff. With an initial thrust to weight ratio higher than two, H-IIA will climb vertically for only a handful seconds before beginning to pitch and roll in order to get aligned with its precisely planned ascent path taking the launch vehicle to the south-east for a trip across the Pacific Ocean, heading to a Low Earth Parking orbit. The four boosters will fire for 108 seconds, in the process burning 66 metric tons of solid propellants and helping H-IIA accelerate to 2.2 Kilometers per second. Burnout will be sensed by the declining pressure in the combustion chambers and separation will be initiated two minutes and six seconds into the flight for the first two boosters and three seconds later for the other two, using the booster thrust struts to ensure a clean separation of the 15.1-meter long SRBs. Powered flight continues on the LE-7A engine of the first stage, generating a thrust of 109 metric ton-force when flying through the rarefied upper atmosphere, consuming 260 Kilograms of cryogenics each second of powered flight. Three minutes and 45 seconds into the flight, H-IIA will be over 170 Kilometers in altitude and split open its five-meter payload fairing as aerodynamic forces can no longer harm the delicate spacecraft structure. The first stage will finish its job six minutes and 38 seconds into the flight, having boosted the vehicle’s speed to 5.9 Kilometers per second. Eight seconds after cutoff, the 37-meter long first stage will drop away to clear the way for ignition of the second stage’s LE-5B engine at X+6:52, soaring to a vacuum thrust of 13,970 Kilogram-force to lift the stack into a lightly elliptical Parking Orbit via a burn of four minutes and 31 seconds. 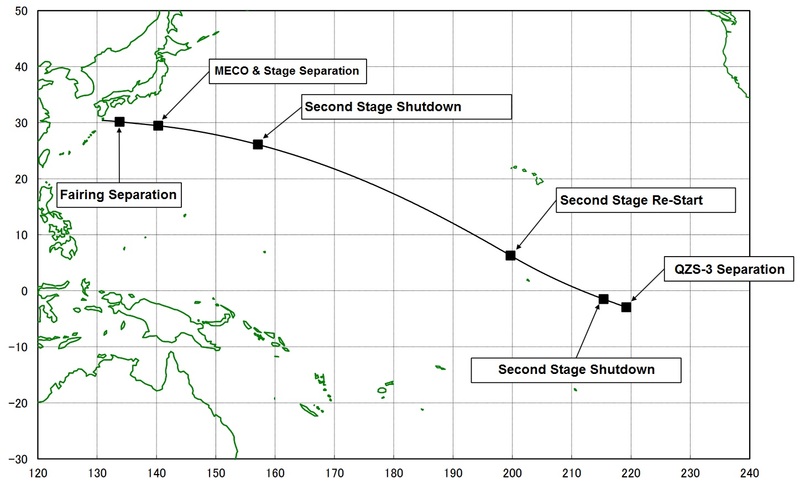 After completion of the first propulsive phase of the mission, H-IIA will enter a coast phase of approximately 12 minutes to continue on its south-easterly path in order to fire the engine again when passing the equator so that the high-point of the orbit can be placed above the equator as well – standard practice in GTO launches. The second burn is targeting ignition 23 minutes and 39 seconds after launch when H-IIA will be 370 Kilometers in altitude. The second burn of the 11-meter long second stage has a planned duration of four minutes and 10 seconds to raise the vehicle’s velocity by 2.5 Kilometers per second and significantly lift the high point of the orbit. H-IIA F35 is aiming for an orbit of 380 by 35,976 Kilometers at an inclination of 20 degrees with spacecraft separation expected 28 minutes and 40 seconds after liftoff. The spring-loaded separation of the satellite will mark the start of its first steps in orbit – going through a stabilization maneuver and initiating communications with the ground for initial health checks that will clear the way for a multi-burn climb into Geostationary Orbit. The QZSS satellites are designed to deliver two types of signals – GPS-compatible navigation signals and GPS augmentation messages that can be used by ground receivers to more accurately calculate user position. 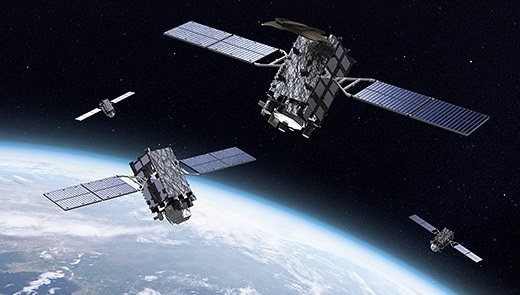 Through the GPS-compatible messages in the L1, L2 and L5 bands, the QZSS satellite can be treated as an additional member of the GPS constellation at high elevation angle from all locations in Japan, increasing availability of GPS. 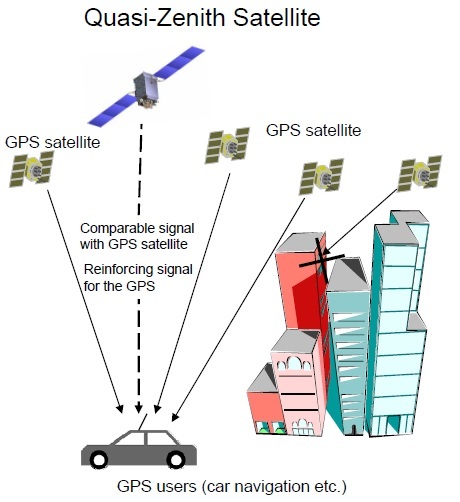 The GPS augmentation approach followed by QZSS is similar to that of the U.S. Wide Area Augmentation System in that a number of ground stations monitor variability in GPS signals – caused by clock errors and ionospheric delay – and provide correction messages to a high-altitude satellite that immediately relays them to augmentation-enabled receivers on the ground to increase location accuracy to around one meter. The first QZS satellite served as a pathfinder and underwent extensive signal characterization and fine tuning before being moved into active service nine months after launch. Studies showed that GPS accuracy was improved by a factor of 2.5 when QZS-1 was overhead and transmitting augmentation code. These results prompted JAXA to order three DS-2000-based satellites from manufacturer Mitsubishi Electric in 2013 for a total of $526 million to establish the QZSS constellation for 24/7 augmentation services, also expanding from an initial three-satellite design to a four-satellite constellation with one craft in Geostationary Orbit to broaden the accuracy augmentation zone to the entire Asia-Pacific Region. QZS-3 as the geostationary member of the constellation weighs 4,700 Kilograms and measures 5.4 x 3.2 x 4.1 meters in size when in its stowed configuration and 19 meters from tip to tip when extending its two power-generating solar arrays. At the heart of the satellite sits a pair of redundant Rubidium Atomic Clocks that provide the ultra-stable timing needed in the generation of regular GPS navigation messages. 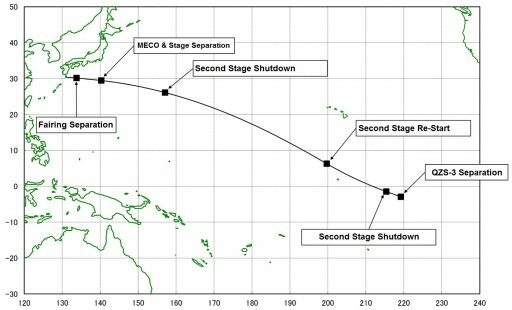 Japan received clearance from the U.S. in 2006 to use the GPS navigation bands as well as the L1-SAIF augmentation signal architecture. Copyright © 2019 H-IIA – QZS-3 | Spaceflight101. All rights reserved.